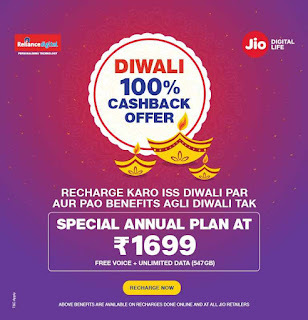 Jio Diwali Offer 2018 '100% Cashback Offer' Get All Unlimited Free For 1 Year ? Jio Diwali Offer Will Launched By Jio. Here we Kmow All About Jio Diwali Offer 2018 Or Jio 100% Cashback Offer. 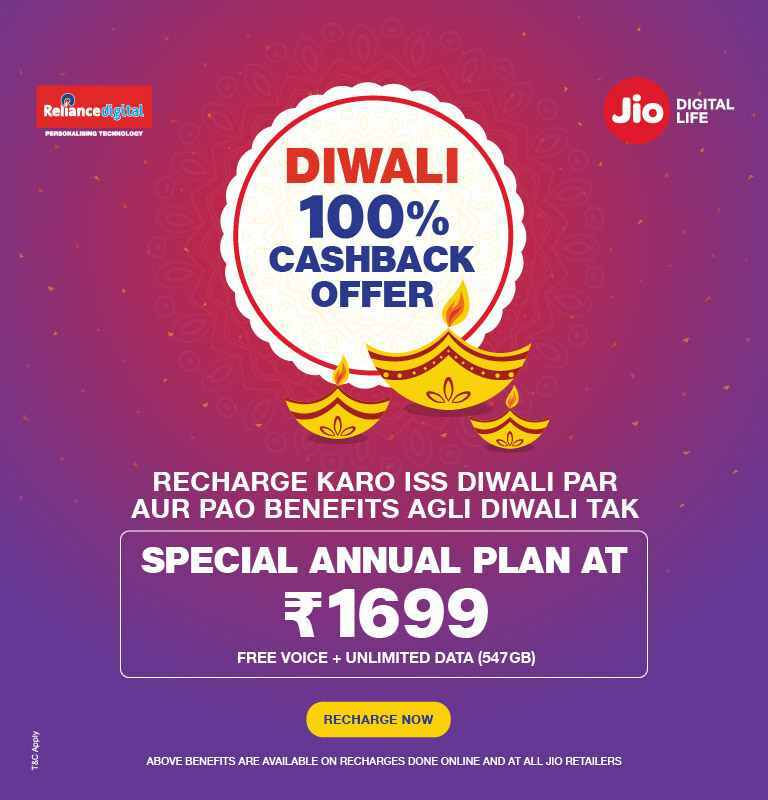 In This Offer You Will Get All Benefits In 1699 Rs For 1 Year So Jio Say "Recharge Karo Is Diwali Par Or Pao Benefits Agli Diwali Tak" So Let's Know Full In Detail Information About Jio Diwali Offer 2018 Its Aslo Called Diwali 100% Cashback Offer. Jio Launched Jio Diwali Offer 2018. Get Total 547GB Data, Free Voice & Daily 100 Sms Fo 1 Year In 1699 Rs. This Offer Valid 18 October To 31 December 2018. 100% Cashback Added In My Jio App As Voucher. Let Know About Jio Diwali Offer 2018 In Details. This Offer Also Called Jio 100% Cashback Offer. In This Offer You Get All Benefits Like Total 547 GB Data 1.5 GB Par Day, Free Voice, Daily 100 Sms & All Others Jio Benefits In 1699 Rs Recharge For 1 Year. How You Will Get 100% Cashback Offer ? Jio Say It's 100% Cashback Offer So Now Know How You Will Get 100% Cashback From Jio Diwali Offer 2018. So You Need To Buy 5000 Rs Product To Get This Cashback ! Cashback Will Added In Your Account As Voucher. You Can Chack In My Jio App. This Vouchrs Are Used For Recharge. The Jio 100% Cashback Also Available For Some Other Jio Recharge Plans Like 149 Rs, 198,299,349,398,399,448,449,498,509,799,999,1099,4999, And 9999 Rs. 0 Response to "Jio Diwali Offer 2018 '100% Cashback Offer' Get All Unlimited Free For 1 Year ?"